Russian museums are famous for their “KGB babushkas” with killer stares. Do you dare talk in their presence? And is it even allowed? No one saw it coming: museum visitors locking horns with guides and administrators. The battlefield of all places was the Tretyakov Gallery, one of the world’s most hallowed repositories of art masterpieces. The bone of contention? An alleged ban on talking in the exhibition halls. Rumors about the absurd ban went viral after a group of MSU lecturers and their students were expelled from the gallery. It was during an educational tour (not agreed in advance) that the incident occurred. Afterwards, the group wrote a letter to the Russian Ministry of Culture complaining that they had been forbidden from “exchanging views” with each other. Social media users immediately began to recall similar cases. This episode at the Tretyakov was described by editor-in-chief of Fashionograph magazine Tim Iliasov on his Facebook page. Undeterred, Tim and friends continued their discussion until being escorted off the premises by a security guard. The museum immediately launched a PR offensive, explaining that talking in the galleries is not forbidden. The Tretyakov introduced mandatory accreditation for guides, so that groups would be able to move around without stepping on each other’s toes. However, Tretyakov Gallery senior researcher Tatiana Goryacheva’s Facebook explanation mingled facts about the incident with emotional outpourings on the problems faced by museum employees: visitors’ low level of culture is a constant bugbear, as are non-official guides. Goryacheva’s post lamented that do-it-yourself guides and their listeners hog (not her word) the “most esteemed” pictures, causing official Tretyakov guides to have to look for detours to keep their groups interested. “Official guides know how to time their tours to avoid clashes with others. But non-official ones couldn’t care less. They do what they like, and can be quite discourteous sometimes,” she opined. Goryacheva went on to say that talking inside the Tretyakov Gallery is not prohibited, and no one would be removed for doing so. Goryacheva subsequently deleted her post, and the Tretyakov Gallery apologized for the misunderstanding. On the plus side, the social media spat has at least revitalized interest in museums as a place to go on weekends. 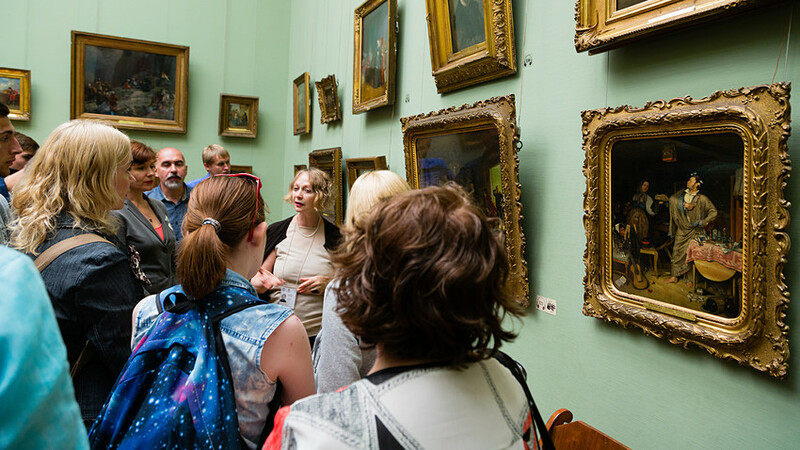 And entry to the Tretyakov Gallery is even free on Wednesdays — talking included! Football fan rating: Who’s having the most fun at the World Cup? Angry Russian: Can you please be less phony?